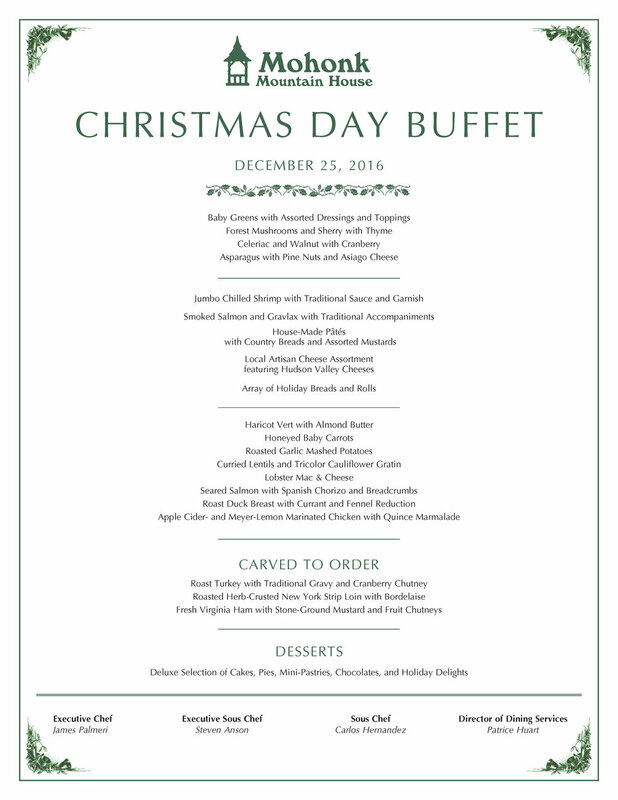 A festive, relaxing way to celebrate the Holidays, this Christmas Day, December 25th, dining at the GRAND BUFFET in the beautiful Mohonk Mountain House in New Paltz, New York. Celebrate the season with family and friends in a spectacular environment enjoying savory food, wines and scrumptious desserts. Enjoy carved to order roast turkey, roast strip loin, Virginia ham, delectable desserts, and more—then check out the fully-decorated Mountain House with fifteen Christmas trees and the Hudson Valley Gingerbread Competition winners. Advanced reservations required. Price: $77.50 adult; $42.25 ages 4-12, excludes taxes and admin fee.